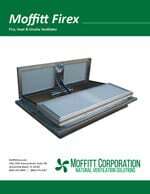 The Moffitt Firex™ automatic heat & smoke vent is designed to evacuate smoke and restrict fire from spreading. It exhausts heat and smoke to protect the building, its personnel, and its contents. It also provides vital access for firefighters in the event of an emergency. Large industrial buildings can be difficult for firefighters, but heat responsive ventilation equipment, like the Firex™ can make their job safer and more effective. 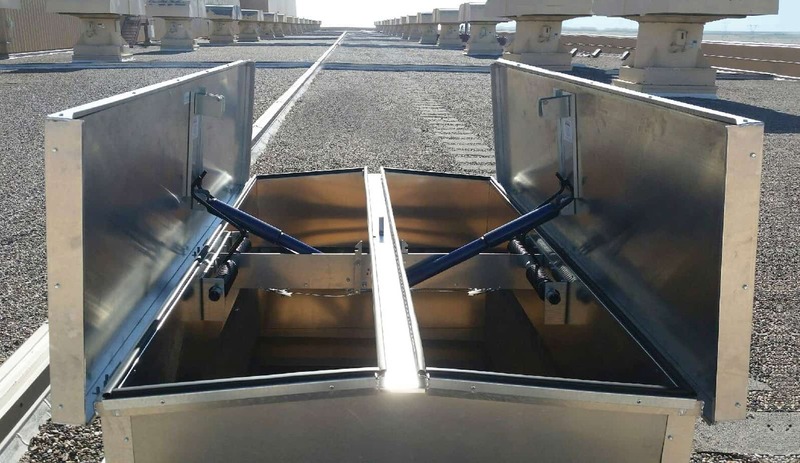 The National Fire Protection Association (NFPA) has proven that the addition of proper ventilation will assist firefighters in accessing the source of the fire and improve their ability to take direct action against. Getting to the fire quicker can prevent smoke logging, explosions, lateral fire spread, water temperature, and steel softening. The Firex™ is known for its excellent craftsmanship and affordability. It has been manufactured continuously since 1956, and tens of thousands Firex™ automatic heat & smoke vent have been produced in the last 61+ years. R&D has been continuous and the design has been upgraded and improved but the Firex™ remains the same great product that it’s always been. One of the Firex™ vent’s best new features is the translucent panels that provide natural day-lighting. 16 gauge galvanized steel lids with G90 mill finish. Other finishes available upon request. * – Not FM Approved for this feature. Only aluminum lids are FM Approved. This unit is designed to be mounted with our without a curb.